You will thank me when you’re 70! We all know that muscles need rehabilitation after an injury for them to function correctly, this is particularly important for the pelvic floor. Up to 37% of Australian women and 13% of Australian men have urinary incontinence (bladder leakage) and up to 12% of Australian women and 20% of Australian men have faecal incontinence (bowel leakage) .This is one of the 3 major reasons for being admitted to a residential care facility (nursing home) as quoted by the Continence Foundation Australia (Australian Institute of health & welfare, Norton et al 2002). 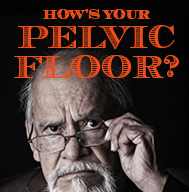 So how well is your pelvic floor working? Pregnancy, menopause, obesity, constipation, chronic cough, surgery, may damage your pelvic floor and put you at risk of incontinence. Having strong pelvic floor muscles gives you control over your bladder and bowel and keeps the abdominal organs supported. Physiotherapists with extra training are qualified to assess your pelvic floor function. If your pelvic floor could have been damaged and has never been assessed then call the clinic on 03 9532 8001 and speak to Susan about the services your may need.